People are not perfect, so are relationships. A smooth flowing relationship takes place when both partners put their efforts to make it work. But because people are fragile, there comes a point that they overlook where their relationship is heading, especially when one partner is willing to give more than is asked of them. When one person freely gives, the other partner always take until this could become a pattern. However, people are beings not designed to only give but to take as well. The one who gives without taking will soon deplete themselves of their own self nourishment. This could result to unhappiness and exhaustion which would eventually hurt the person and the relationship. If you feel exhausted and out of balance in your relationship, then it might be one sided. 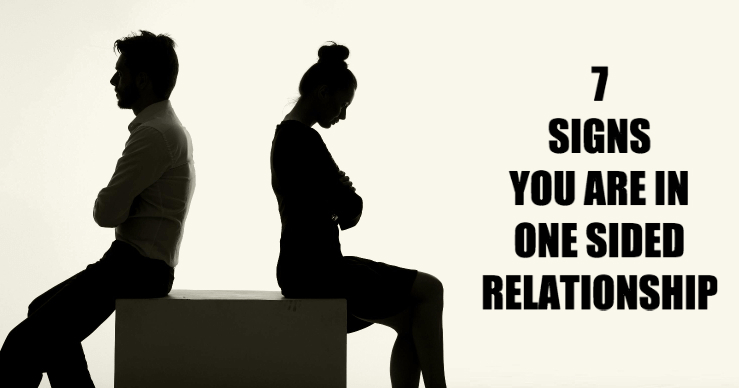 Here are more clues that tell you you’re relationship is one sided. 1. You’re always there for them but they can’t do the same for you. They are your number one priority in life. Whenever they need you by their side, you’re able to ditch everything in your schedule just to be with them. But when you’re on the same situation, you hardly have their attention. They can’t be with you always. 2. They’re a part of your life, without feeling a part of theirs. You have allowed them to enter in your life. They’ve meet your close friends, peers, or even family. Whatever the events in your life is, you always make sure they’re present. However, you have a hard time entering into their lives. It’s as if their life is private and you’re not welcome to enter nor become a part of it. It makes you feel you’re just one of their colleagues and not someone special. 3. It’s always you who make the effort of having a time together. When it comes to giving them your time, no one beats your generosity. You’re able to set aside everything if you want to be with them. But, when you ask them of their time, they’re either busy or doing something very important, as if you’re not one of those important things. You lost count of the alibis they’ve given you. If this is the case, it’s clear they’re not that serious in the relationship. 4. You’re not your true self in their presence. You’re on constant guard in their presence, making sure every act or word you say is right, otherwise they’ll get turned off when your actions or words don’t please them. In short, when in their company, you’re a person other than your true self. And this exhausts you because it makes you feel uncomfortable to pretend you’re someone that you’re not. Feeling discomfort in the presence of someone who is suppose to accept you as you are is definitely ironic. 5. You’re always asking for apology. You could no longer remember how many times you say ‘I’m sorry’. An apology is always expected from you whenever they find a flaw in your manners or words no matter how simple or silly it appears. If this is a regular occurrence in your relationship, you have to think twice. Ask yourself if you want to share your life with a person who does not make you feel good. 6. You think twice before talking to them. As a loving partner that you are, you love to call them at the end of the day just to ask how their day went. Instead of thanking you, they’ll get angry with you for disturbing them and even make you feel guilty about it. Thus, you have to think twice every time you feel the nudge of calling them. On the other hand, they’re too busy to even give you a quick call. They seem to be so distant, you find it difficult to make a connection. 7. They make you feel that your relationship is an obligation they need to do. You always find the initiative of keeping your romance alive. Whenever you ask them to do their part, they’ll feel as if they’re obliged to do something and not because they truly love you. They’ll give you the freedom to do all the plan and the execution, while they just go along as if they can’t do anything about it.